Tickets went on sale today for The Smokers Club, what looks to be Goldenvoice’s first foray into throwing “culturally significant” and “community integrated” events at the Queen Mary since the partnership was announced. 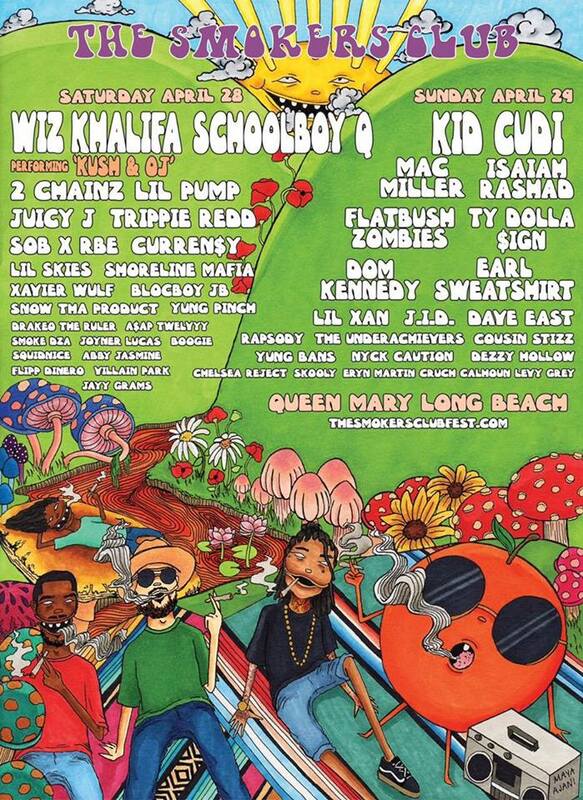 The two-day festival will bring a hip-hop lineup to Long Beach on April 28 and 29 with Wiz Khalifa and Schoolboy Q to headline on Saturday and Kid Cudi to take the stage Sunday, during an event focused on celebrating a certain plant-based pastime. Khalifa is expected to perform tracks from his 2010 mixtape, Kush & OJ, according to Complex. Other artists include Lil Pump, 2 Chainz, Dom Kennedy, Mac Miller, Flatbush Zombies, Ty Dolla Sign, Dave East, Rapsody, Curren$y, Juicy J, Trippie Redd, Joyner Lucas, Earl Sweatshirt, Isaiah Rashad and more. One-day passes start at $85 and weekend passes range from $150 to $299. VIP passes are also available starting at $200. Tickets can be purchased here.